Rock Band CNBLUE’s vocalist Jung Yong-hwa was acquitted of charges of illegal stock trading after obtaining insider information, according to the Prosecutors’ Office and his agency FNC Entertainment Thursday. The Seoul Southern District Prosecutors’ Office, however, slapped fines of 20 million won ($17,200) on Jung’s bandmate Lee Jong-hyun and 40 million won on a staff member at FNC Entertainment. The Prosecutors’ Office said it could not prove that Jung purchased the stocks in 2015 because of the news that FNC Entertainment signed a contract with acclaimed TV show host Yu Jae-seok, citing a weeklong gap between Jung’s stock purchase on July 7 and 8, and the emergence of insider information on July 15. FNC Entertainment announced that on July 16, 2015 that Yu joined the agency, causing the firm’s stock price to rise by the daily limit of 30 percent and leading to Jung’s profit of 200 million won after his shares were sold. 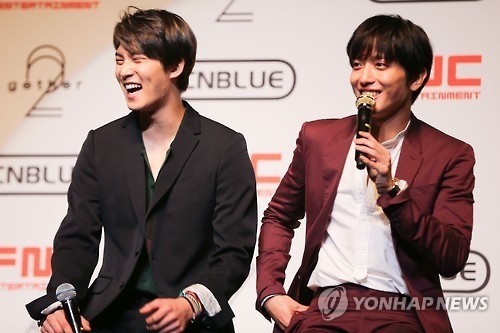 However, FNC Entertainment in a statement released Thursday said Jung’s mother sold the stock. The statement added she had little experience in stock trading and did not notify Jung of the trading. In contrast to Jung’s case, the Prosecutors’ Office said Lee, the guitarist of CNBLUE, obtained the information of Yu Jae-seok contract a day before the announcement from another staff of his agency and bought shares in it. Lee didn’t sell stocks immediately after the surge in stock price, but the staffer sold her shares, the Prosecutors’ Office added. Lee reportedly sold part of the stocks in January. The original source of information in FNC Entertainment was acquitted of charges, as the Prosecutors’ Office couldn’t prove that the source recommended Lee buy the stocks.